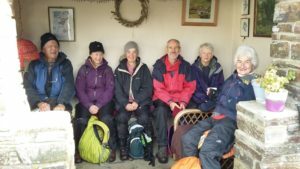 The longer walkers had “coffee with style” on a winter’s day walk. At break time, they stopped for a coffee at a bus shelter in Walkhampton that has been mysteriously decorated and furnished by an unknown person sparking intrigue in the local community. The ‘Banksy-style’ makeover started a couple of years ago with a comfortable chair and there have been regular additions since then. On a damp December morning, the bus shelter provided a welcome venue for a well earned coffee.